Wild Fennel Pollen for sale. Buy online at Zingerman's Mail Order. Gourmet Gifts. Food Gifts. Fairy dust for food lovers. 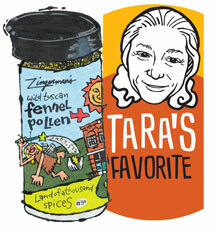 Tara Stow is our Kitchen Captain and a master gardener at Zingerman's Mail Order. I love cooking with (and growing) herbs and spices. In fact, it’s an interest I’ve had for a very long time. In college I visited markets in Colombia and Ecuador for a research project on ‘Spices of the New World Tropics’. Over the years I’ve done a lot of experimenting with different spice flavor combinations (with and without success at times). My current favorite spice to experiment with has been our wild fennel pollen from Tuscany. I love the exotic flavor it lends to fish, chicken and especially pork. Most recently I found a wonderful combination combining it with our Urfa pepper from Turkey, ground ginger and sea salt as a rub for pork roast or spare ribs—a favorite lunch of many of our staff.